Please note that these time packages are for a continuous hire time.....Your time begins when you ask us to arrive at the first pick up point ( whether that is picking up the guys or the girls or family - who ever ) and your hire pak time ends when you would like the vehicle to finish for you ( eg when you arrive at your reception and have finished with the vehicle and ask us to leave ) ...It is your dedicated vehicle hire pak for the time required ....We will go where ever YOU require during your hire pak.....If at this early quote stage you do not know all your EXACT details- don't worry - The most important info we really need to give you an exact quote and availability would be your starting time and starting suburb and your finishing time and finishing suburb. This bonus offer is on a limited basis only and is subject to availability. Please note that when paying in full online all payments and bookings are still fully checked and receipted manually in our office & all details are posted directly to you ASAP. With your wedding coming up have you organized your wedding limousines ? 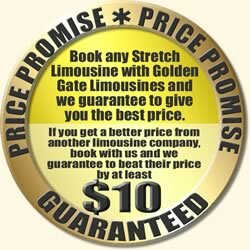 Well we at Golden Gate Limousines would like to help by offering you a special package. As a Premium Wedding Limousine company we would like to show you the difference in our services, vehicles and chauffeur's. As a company that only does special occasions (e.g. weddings, proposals, birthdays etc.) So you can be assured that ALL of our services, vehicle's and chauffeur's are of the highest professional standard available. Our aim is to make YOUR special day as special and easy as possible, particularly your transport requirements. We offer a full range of wedding packages and we would like to be a part of your wedding day. all listed prices / specials / bonus' are not available for all limousines on all days. Limited changes are permitted - fee's may apply. All prices are correct as of 01/01/09 but may fluctuate as all are subject to availability. If you have a different idea, a comment or any feed back, or just want to know some more info about these specials, or could not find what you where looking for, anything....Please click here to ask us or give us any feed back at all !!! The above offer is based on a first in first served basis and is subject to availability for all booking conditions please visit the above web site. Our vehicle's and service's are NOT the cheapest, we are a Premium Wedding Limousine company offering COMPLETE wedding packages with full flexibility and NO hidden charges.Its YOUR special day YOU tell us what YOU want, and that's what will be done. Please feel free to contact our office as we would love to be part of YOUR special day.